Like millions of people around the world, I was glued to the television set for the greater part of Friday 29th April 2011. By a twin conspiracy of a business engagement and conjunctivitis, I was not meant to watch the event live, however by a more powerful design, the business engagement was shifted without my prompting and the conjunctivitis had cleared by the morning of the wedding. So there I was at 9.00am sitting pretty before the television at the start of an incredible channel hopping exercise that lasted for hours. · Only the Brits could have put up such an impressive performance, unforced, highly entertaining and time conscious. Everything was properly planned to the minutest detail. · The entire service took all of 75 minutes. That’s not enough time for many Nigerian Pastors to give their sermon. There was no shouting by the priests, no attempt to upstage the couple, no ‘too big for their boots’ moments by any of the ministers. They led, prayed, joined, and preached with dignity, panache and with the focus on the solemnity of the occasion. · Did you notice that there were no blaring siren; no over the top security men pushing and pulling people out of the way for important dignitaries, no standby generators in the event of power failure, no terrorising area boys, no aso-ebi. · I also hope that Nigerians will take note that all guests should be seated before the arrival of the bride. · I was fascinated by the little details, like the men that received and delivered the caps and gloves from Princes William, Harry and other senior members of the royal family at arrival and departure from the Abbey respectively. My wife opined that if it was in Nigeria, a glove might be missing when it was time to deliver them or that one of the keepers would have gone to the lavatory at the crucial time he was needed. · I doff my hat to the heavily armed police officers lining the procession route and watching the crowd for any acts of terrorism. How about being at the event and also not being there. None of them stole a glance of the event happening behind them. Theirs was the height of professionalism. · I admire Prince William’s thoughtfulness in mingling with the crowd on the evening before the wedding. Interpersonal skills par excellence I would say. · After the first kiss, I listened to Piers Morgan, who as the all knowing royal pundit on CNN authoritatively proclaimed William will never do a second kiss because royals are trained not to give more than what is necessary. The word had barely left his mouth when the second kiss happened. I could not see Piers Morgan at the time, but I could almost see eggs splashed all over his face. As someone said, the first kiss was duty, the second was definitely romance and it proved that the young man is at ease with himself and not encumbered by the stuffiness of royalty. · The drive by the couple from Buckingham Palace to Clarence House shortly after the wedding was a crowd winner. The decoration and the ‘L’ plate on the car almost certainly have Prince Harry’s handwriting all over them. · What about the priest who did the multiple cartwheel display at the Abbey after the ceremony. It was probably his way of breathing a sigh of relief. Perhaps it was his way of praising God for a successful outing. Who said the British are stiff? · The wedding is a proof that all things are possible. Kate Middleton is not only married to the future King of England, she will be crowned Queen and one of her children will become Queen or King of England. Would she have imagined all these 10 years ago? This reminds me of Paul’s letter to the Ephesians: “God can do anything, you know—far more than you could ever imagine or guess or request in your wildest dreams! He does it not by pushing us around but by working within us, his Spirit deeply and gently within us” Ephesians 3:20. 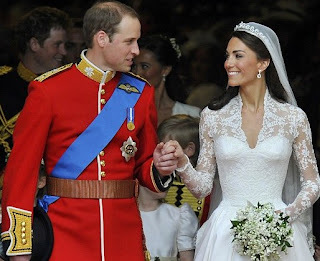 · It is almost certain that Prince William was only allowed to marry Kate after the royal family were sure there were no skeletons in her past. In other words, the past has a role to play on the present and how you live your present determines your future, so it is advisable not to live a reckless life. · The sacrifice that women make was fully played out during the ceremony. Wasn’t it ironic that of all the five members of the Middleton family, only Kate’s mum, Carole Middleton did not have any public role at the wedding? Daughter Kate was marrying the future King, daughter Pippa was the celebrated maid of honour, son, James read the Bible passage and husband, Michael accompanied their daughter to Church, led her to the altar and stayed until they were joined together. Carole, the woman who carried Kate in her womb for nine months, and went through the pain of delivery; the mother who fed and nursed her for years was for all intents and purposes a spectator. I have always felt that this is an African thing. I now know it isn’t. Little wonder the Bible prescribes in 1 Peter 3:7 that a husband should love his wife and honour her. Even if you have never thought of this before, think again. · The wedding unintentionally showed the two parallel worlds that exist in Britain. Those in the Abbey are streets apart from those lining the streets to cheer the couple. The Abbey guests are the Eton-Oxford, land-owning champagne-quaffing pack whose hats for the occasion will pay the entire mortgage of most people for a year. Very occasionally, the footballer who has made good like David Beckham or the world-acclaimed musician like Elton John may be able to cross the carpet from the lower world to the upper class. Otherwise, the two classes are set apart by the family you are born into or which school you attended. That’s why more than half of the current UK cabinet are Ox-Bridge educated and 75% are millionaires including the Prime Minister, his deputy and the Chancellor of the Exchequer. No one should begrudge them about this; it’s just the way things work. You need to be outstanding to enter this new world. · This leads me to the next point - why parents must plan for the future of their children. Kate’s parents are self-made millionaires who were moneyed enough to have their children publicly educated (this means large fee paying private education in Britain). Kate attended £29,000 fee per year Marlborough College followed by the 600 year-old St Andrews University, one of the four leading universities in the UK where she met Prince William. In other words, Mr and Mrs Middleton made it their business to provide a good foundation for their children. The result is what we have seen. Kate Middleton would probably not have met Prince William if she studied at a pedestrian London university. · Sadly, many Nigerians living in England only ever see the struggling life and have no serious strategy for their children to move up to the other side. They hardly visit the art galleries, attend theatres or go to the museums which are free. We had better wake up and smell the coffee. · The ceremony showcased the importance of marriage, and why no one should put asunder what God has joined together. The symbolic use of his sash to bind the hands of William and Catherine by the Archbishop of Canterbury underscores this point. I felt the ceremony will strengthen the marriage institution and will make many opt for it. I also hope that many who may be struggling in theirs will be guided by the words of the vows and find grace and strength for the enduring commitment required. · Sorry, Mr Alistair Campbell, British people still do God. Even atheists Deputy Prime Minister Nick Clegg and Leader of the Opposition Ed Milliband had to offer songs of praise to God. Whatever people may say, God is still very much central to the core tradition of the British people. · The event was rich in both tradition and history. Westminster Abbey is nearly 1000 years old; the Queen got married and was crowned there in 1947 and 1953 respectively. The Queen herself is all of history, tradition and continuity personified – her first Prime Minister Winston Churchill was born in 1874, her current Prime Minister was born in 1966, and she would be 60 years on the throne next year. · I am fascinated by the rigid pecking order of the royal family which determines everything including sitting arrangements, order of arrival and departure, titles and more. It is curiously interesting that the Princess Royal, Princess Anne, who is the second child of the Queen is way below her two younger brothers, Prince Andrew and Prince Edward and their respective children just because she is female. I think the law of primogeniture should be changed. · The wedding also revealed the delicate balance between the Church, the Monarch and the Executive. The Queen is highly respected as head of State and she gets the pomp and pageantry, yet, it is the Prime Minister that exercises nearly all the power. He can even arrange for the abolition of the monarchy. · Does the queen look like someone who turned 85, eight days before the wedding ceremony? How can she die, when millions of people one way or the other daily petition God to keep her safe? · Just wondering! Should Nigeria decide to adopt a constitutional monarchy style of government, how do we unite our babel tongues? Who would we adopt as King of Nigeria? Would it be the Olowo of Owo, Oba Folagbade Olateru-Olagbegi III or the Oba of Benin, Uku Akpolokpolo, Omo n'Oba N'Edo Erediauwa? Would it be the Sultan of Sokoto, Muhammed Saa’du Abubakar; Alafin of Oyo, iku baba yeye Oba Lamidi Adeyemi; the Obi of Onitsha, Alfred Nnaemeka Achebe or Ooni of Ife, Oba Okunade Sijuwade? The case will probably sit in court forever. · There is no denying the fact that the couple are in love, they looked at each other’s eyes when they took their vows; they stole glances of each other even when the sermon was being delivered. According to lip readers, he said, ‘you look beautiful’ when she arrived at the altar. ‘Are you happy’ she said when they were entering the coach at the end of the service. How else can fondness be defined? · The bride had a great smile, an enviable figure and she was elegant and stylishly turned out. The groom has a good personality; his head appears well screwed on. In his hands, the future of the monarchy is assured. I wish them well. Finally I will like to borrow the first hymn at the wedding which is very powerful and apt for everyday living. This hymn like many others has in-built life and I’m sure many lives would be transformed by it. If like me, you need God to guide you through the minefield of life, then it’s a song to sing. Interesting tho'ts although post a bit too long to read without full focus. May their marriage be blessed. @Anonymous above, whilst the husband of a queen is not crowned king, the wife of the king is always crowned queen. The current queen's mum was crowned with her husband George VI as Queen Elizabeth, so was her grndmother, Queen Mary, wife of George V.
Lovely post Gbenga, I always look forward to your rather interesting perspective on things, even though I hardly ever comment. Also thank you for clarifying the point made about Kate being crowned Queen. I always thought Prince Phillip was the prince consort because he was a prince marrying the head of the British monarchy. Truly Kate & William's story has all the makings of a true fairy tale. I sincerely hope they have a very happy ever after. We always love your postcards!!! Your thoughts on the sheep & goats were great, but I was fascinated by your thoughts on the Royal Wedding......like you I was glued! I really like & agree with everything you said. The other thing that impacted me was that William declined the offer of a 'Prenuptial Agreement'. The marriage really is built on trust & love. Wow what a statement that is! Just how God intended it! !